Who needs 3D Tube Acoustic Wall Panels? If you find that you or your team get distracted by background noise when you're trying to work, these panels help you create a more sound-sheltered office space that can help you focus. Shared workspaces and almost any room could do with more sound insulation! As many as you have room for! Panels are 19.75" square, so if you do a little math you can figure out how many panels you can fit on your wall. Or just use a single panel to reduce a few decibels in your immediate work area. How hard is this panel to install? Installation is as easy as hanging a picture. Just affix two nails or picture hangers to your wall, and you'll be good to go. If you'd prefer not to use nails, we also offer optional 3M Command Strips, which will allow you to stick your panels on. Check out our assembly instructions for a look at all the ways you can install your new panels. How much sound is absorbed? 3D Tube Acoustic Wall Panels have a Noise Reduction Coefficient of .8, which means 80% of sound that reaches the panels is absorbed. 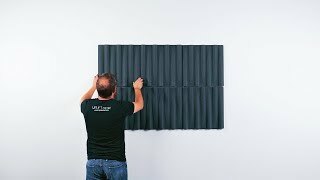 In Acoustics, zero absorption is 0 and perfect absorption is 1, so these panels greatly reduce noise for you and your coworkers with an easy addition. Add the 3D Tube Acoustic Wall Panel in white or dark gray and enjoy better acoustics in your office space. The polyester fiberboard panel absorbs ambient noise so you can concentrate on the task at hand. The .8 Noise Reduction Coefficient means that the panels absorb 80% of sound, while allowing only 20% to reflect back into the room. These multi-tasking panels look good on the wall and work to reduce the noise put off by your office mates. Hang them on your wall and enjoy a little more peace and quiet while you work.